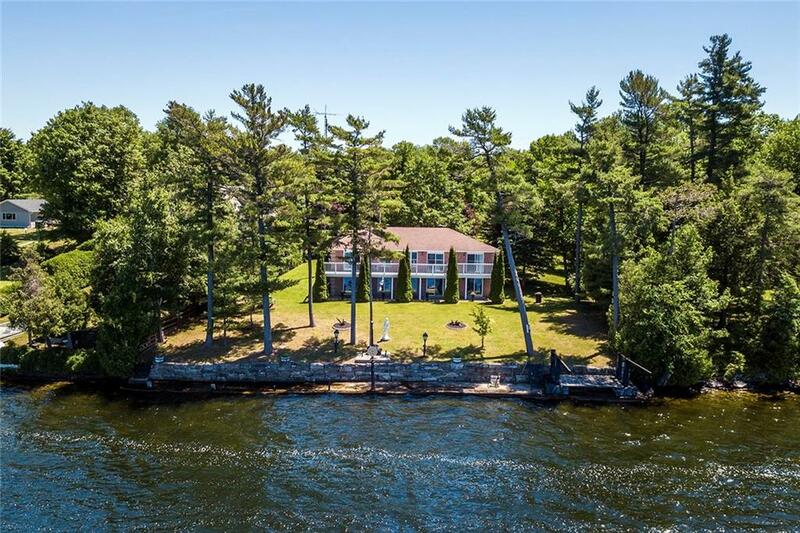 Amazing 120ft of swimmable weed free waterfront on the Lower Rideau Lake with oversized lot. This property has hand made retaining wall, 100ft concrete dock, boat lift, all from gentle slope from house. The home is two bedroom plus den upstairs with huge(26×12) living room facing the water for sunsets, which leads to your 66ft walkout deck, great for BBQ or entertaining. Nicely sized bright kitchen with all modern touches and full bathroom. 2 car garage completes upper portion of this house. In the lower part of the home is a massive rec room (31×14) with walkout patio doors also facing the water. Two more big bedrooms ,wet bar, full bathroom, cold storage, utility room and large laundry room complete down stairs. All rooms are tastefully finished ,living room and recreational room have hardwood through out. On back portion of property the owners have moved and kept original cottage,with little TLC would make great guest house.Trees line both sides of property. © 2019 Rideau Realty. All rights reserved.